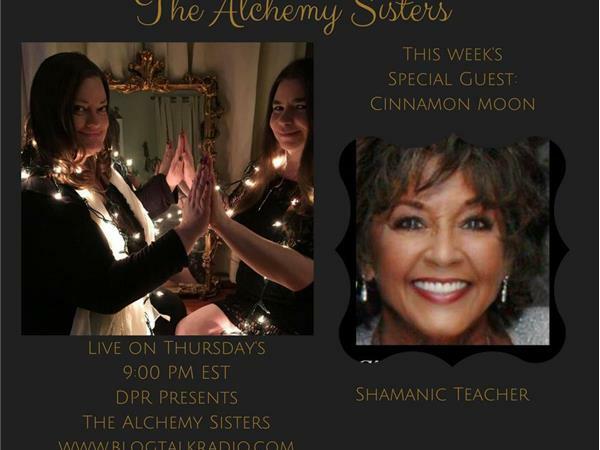 The Alchemy Sisters are live on Drew Pillow's DPR Presents with Blogtalk radio every Thursday at 9:00 pm EST. Each week their show discusses a new topic. Topics are loose, as they like to allow spirit to guide the conversation. All discussions are in relation to the multiverse, healing, navigating life, and the divine energies. Through their own wisdom, as well as, special guests, they intend to bring awareness, clarity, knowledge, and free healing to their listeners. Jennie McDaniel and Mandee Elam are Divine Feminine Healers who help people to initiate healing through their psychic and spiritual gifts. They believe that in order to balance the divine energies within each soul and the planet, we must raise the consciousness and awareness of the people. Their mission is to shift our energy by raising the heart over the ego and bringing balance to each soul. This week's special guest us Cinnamon Moon! Cinnamon has been a Shamanic Teacher and reader for 50 years!